Win a Car at Wincanton Racecourse on Boxing Day! Visitors booking tickets in advance to Wincanton Racecourse's Boxing Day meeting have a chance to win a brand new car. The racecourse has teamed up with local car dealership F.J. CHALKE to offer a Suzuki Alto SZ 5-door car. Wincanton's Charity Race Day was launched in 1997, with St Margaret's Hospice being a principal beneficiary for over a decade. Taking place this year on Sunday 28th October, the meeting hosts a marquee reception and a silent auction. Wincanton Racecourse recently took horseracing to St Margaret's Hospice (Yeovil) in celebration of the forthcoming Charity Race Day on 28th October. Staff, patients and family members were able to experience firsthand the phenomenal beauty of a racehorse. To celebrate the return of racing to Wincanton on Thursday, 18th October, after its annual four-month break, race-goers will be treated to a parade of racehorses, featuring some of the stars from the West Country. Who Will You Be Wearing at Somerset Life Ladies Day? On Tuesday 15th May the female population will display their fineries at Wincanton Racecourse for Somerset Life Ladies Day. 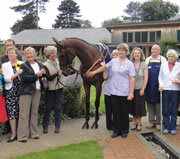 It's one of the biggest social occasions in the regional calendar, where ladies steal the limelight from the jockeys! Enjoy evening racing at Wincanton Racecourse on Thursday 10th May, with entertainment provided by the Mangledwurzles, and Somerset Life Ladies Day on Tuesday 15th May, a glamorous day with prize for Best Dressed Lady, a Ladies Luncheon and fashion show. On Sunday, 22nd April Wincanton Racecourse celebrates Countryside Day with an action packed day of displays, demonstrations of countryside pursuits, competitive racing PLUS a parade by Grand National winner Neptune Collonges with trainer Paul Nicholls and jockey Daryl Jacob. With the Higos Insurance Somerset National Day on 5th April and Bathwick Tyres' Countryside Day on the 22nd April, be sure to book your days out in April at Wincanton Racecourse. During March Wincanton Racecourse will host three marvellous consumer race days, with free admissions on 8th March, a Legends of Cheltenham theme on 9th March and fun for younger ones on Children's Day on 25th March. To help ease the burden of wedding day expenses, Wincanton Racecourse is offering all couples who get engaged on Valentine's Day (February 14th) or on Leap Year Day (February 29th) a half price reduction on room hire. Saturday, February 18th 2012 sees Wincanton Racecourse host its seasonal highlight - Bathwick Tyres Kingwell Hurdle Raceday - with a noteworthy £122,000 total prize fund. Bring the family for some top quality racing! With ten race fixtures still ahead of us here at Wincanton Racecourse, plan your days out and join us for an exciting season of racing in 2012. Wincanton Racecourse kicks off the New Year with a fine day's racing on Saturday, January 7 with the Bathwick Tyres sponsored race day, which has attracted Channel 4 Racing coverage. Gates open at 11.00am with the first race off at 1.10pm. A £10 voucher for future hospitality! On Monday, December 26th Wincanton hosts its festive Boxing Day fixture that traditionally attracts over 12,000 race-goers. Work off the excesses of the previous day with six competitive races to punt on. Are You Ready for Christmas? Wincanton Racecourse is! It’s only four weeks till Christmas and Wincanton Racecourse has every aspect covered. Here's a breakdown of their calendar over the festive season.